If you’ve spent any time developing a marketing campaign or creating a landing page to promote a lead generation offer, you know the amount of work that goes into planning and execution. You likely have benchmarks and goals in place, but have you developed a plan to track metrics and actively monitor your campaign? Everyone loves data these days, but which data points are essential to appropriately analyze your landing pages? Whether you have pillar pages, an eBook download or you are monitoring a paid search landing page, Google Analytics can help you track your landing page and campaign success. And you’ll be happy to know, it’s easier than you think. 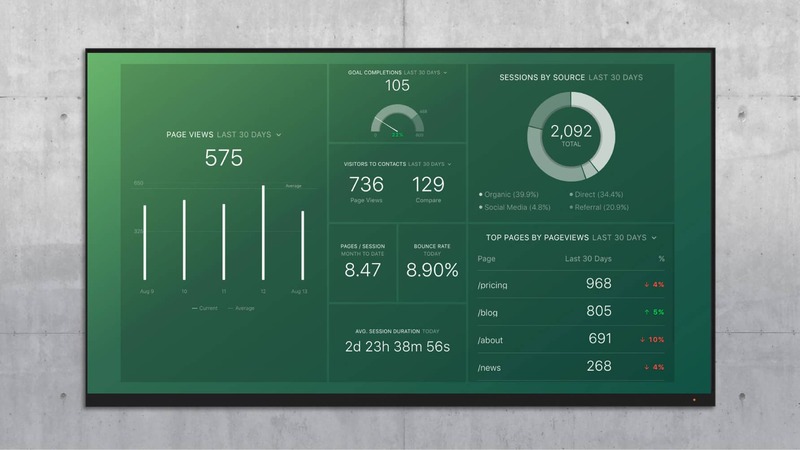 Marketing dashboard templates are an easy way to capture and analyze your data. Google Analytics offers some robust dashboard templates, but having the ability to drag and drop the key metrics you need for your unique campaign is ideal. Using a tool like Databox, you can easily create databoards of your landing page campaigns for monitoring, real-time assessment and sharing. The Google Analytics dashboard pictured below is a free template designed with a singular purpose: to track traffic and leads for a landing page. Let’s move on to review why the metrics shown above are essential to include in your campaign analysis. To appropriately evaluate your campaign landing pages, there are specific data points you should be tracking. 1. Landing page views. The first step of managing your campaign analytics is to establish how many visitors are actually coming to your landing page. Using Databox, you can see the traffic volume daily, which can help you recognize patterns. Do more people visit during the week or on weekends? What events or promotion triggered spikes or lulls in views? 2. Sessions by source. Knowing where website traffic is coming from is one of the key aspects of landing page analysis. Organic, social, paid, referral, direct, email, or others, may help you understand what is or is not working in your campaign. If you are monitoring a pillar page, for example, you’ll want to identify your organic reach and also consider if paid components, like search and social ads, can help increase traffic and conversion rates. If you are monitoring a lead generation offer, analyzing your landing page sessions can help you see which promotional channels are working for you – is it blogs, or social or email nurturing? Take whatever works, and amplify it. 3. Goal completions. 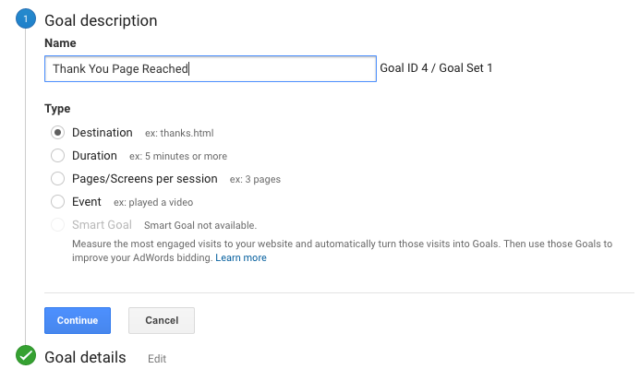 To track conversions on your landing page, you’ll first need to set up goals in Google Analytics (full tutorial on that below). By connecting a goal to the thank-you page of your campaign, you’ll be able to monitor exactly how many people visited your landing page and took action by completing a form, clicking a link or downloading an offer. Monitoring your goal completions in real time is an impressive metric for your clients or your C-Suite. 4. Visitors to contact ratio. Establishing your visitor-to-contact ratio is essential to reverse-engineer your campaign goals. 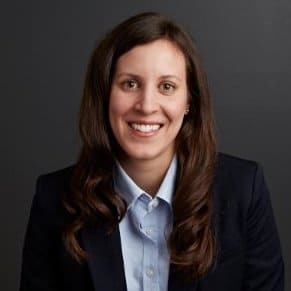 Establish the number of contacts you need at the end of your campaign, and maintain campaign momentum by consistently driving the number of visitors needed to convert the desired number of prospects into leads. 5. Average session duration. Monitoring how long visitors stay on your landing page is very important. If you have an educational landing page, for example, knowing that visitors spent time on your page means the information you are providing is valuable. If your session durations are very low, you may consider improving or increasing your landing page content. In many cases, you want your landing page to show credibility, build trust, highlight your expertise and encourage visitors to take action. Your offer was not clear and visitors were unsure of the action they should take. Your campaign promotion and messaging was unclear or misleading and visitors were disappointed once they hit the landing page. 7. Pages per session. You want to track pages per session to ensure that visitors are getting the information they need to make a buying decision. Are you using pillar pages? Tracking pages per session can help you determine if your content hub contains enough valuable information. Using an educational landing page? Too many pages per session may mean they didn’t get what they needed from your main landing page or they just weren’t ready to make a buying decision. 8. Top pages, by pageview. The last calculation you may want to consider in your landing page analysis is an overview of how your landing page is performing in relation to all of your other website pages. This can be especially important if you are monitoring a number of campaigns or landing pages at once and you need to determine where to allocate additional budget dollars. With these eight data points, you should be ready analyze your landing pages with confidence. And remember with Databox, you can drag and drop any metric into your databoard making everything custom to your exact analytical needs. 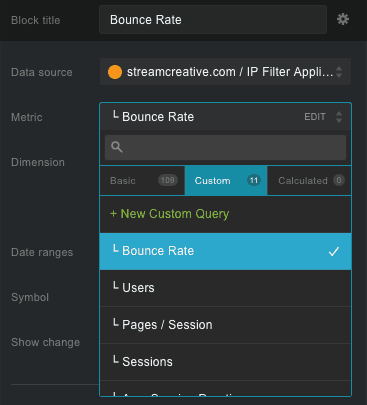 To get your campaign tracking started, let’s review how to set up goals in Google Analytics and how to use custom queries in Databox to help you build robust metrics specific to your landing page. 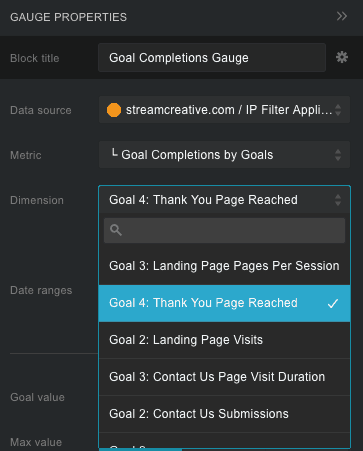 To get started with your landing page tracking dashboard, you’ll need to login to Google Analytics (GA) and follow this step-by-step guide to creating goals. 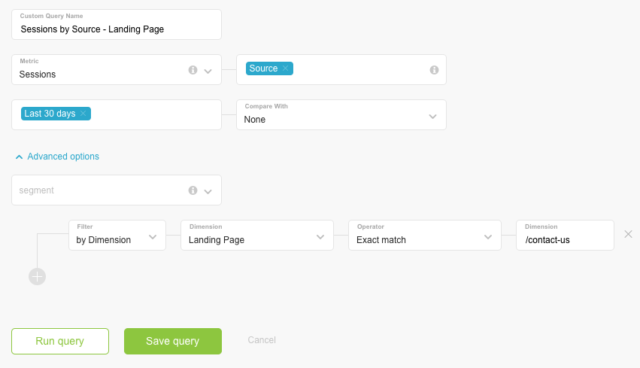 This will be necessary to track conversions on your landing page. 1. Click the admin wheel and select GOALS under the ‘View’ menu. This will take you to a page that shows your existing goals. Here, you’ll need to add a new goal specific to your campaign. 2. To do this, click NEW GOAL. 3. Creating a new goal is very simple. Complete a goal description: what you’d like to call your goal and select the goal type. In this case, select Destination and click Continue. 4. The next screen will ask you to add the URL of the destination, in this landing page example, we used a form-fill that directed users to a campaign specific thank-you page. Select ‘Equals to’ type in the landing page and click save! Now your goal is complete and should appear ON. Now that you are all set up in Google Analytics, it’s time to connect the dots in Databox. Once you login to Databox, you’ll need to connect some of your data cells with your Google Analytics goals. Click on the selected data cell and you should see a menu pop up that allows you to select your goal from Google Analytics. Select the metric ‘Goal Completions by Goal’. Under ‘Dimension’, you will be given a dropdown list of all of your GA goals. Scroll through to find the goal you want to track and click to populate the data in your databoard. Using Databox and Google Analytics you will be able to monitor your campaign landing pages like never before. Now that you have your GA goals in place, follow the tutorial below to see exactly how to connect it all together with Databox custom queries. 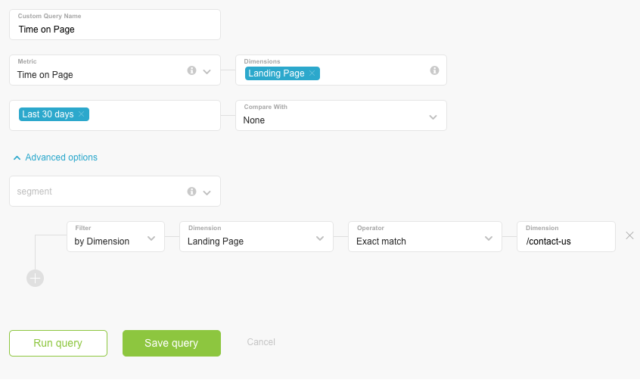 To build queries based on a landing page, select Landing Page as your Dimension parameter and follow the examples below. For Average Session Duration or Time On Page, you want to ensure you are looking at the specific landing page data, not the entire site. Use the landing page dimension perimeter and the advanced options to select the specific landing page to analyze. Select your Metric, in this example, we chose ‘Time on Page’. Select your Dimension, here we are focusing on a specific landing page. Select your date options, here we selected “Last 30 Days’ for a broader snapshot. Select your Dimension, again select ‘Landing Page’. Select ‘Exact match’, to focus on a specific URL. Type in the campaign landing page URL. Follow this same query process to build out ‘Bounce Rate’ and ‘Pages Per Session’ for your landing page. To establish ‘Sessions by Source’ data for a specific landing page, note below that your Dimension perimeter changes to ‘Source’, but your Advanced Options stay focused on the landing page of choice. Now that you have created your custom queries, you just need to connect them to your databoard. Under Dimension select ‘Custom’ to show your custom queries. Select the query you wish to use and your data will populate. Janice Dombrowski Janice is a Marketing Consultant at Stream Creative. We are data-driven, process-focused marketers who love to help businesses grow.